Letter from Anarchist Prisoner, Emma Sheppard, in support of the International Week of Solidarity with Anarchist Prisoners. Our fearful trill is the combination of frustration, despair, indignation and defiance. The “Incentives and Earned Privileges” scheme that dominates prisons today goes a long way to silencing our songs through its passive coercion and pastoralism, but they always erupt sporadically. Being in prison has made me feel humble. My fixed-term sentence is short, and unlike many, I have a release date. I am humbled by the fire and conviction which fuels long term anarchist prisoners, and the many rebels in prison who are “perpetually seeking” in their own ways, free from (and often unknown to) the anarchist subcultures. Quietly rejecting and challenging authority everyday in a way to keep sane inside. These rebels and actions give me hope. I do not consider myself a tiger! But as Michael Gove said in his first speech as ‘Justice Minister’: “Civilisation depends on clear sanctions being imposed by the state on those who challenge the rules”. So they put us behind bars and try to drown us in petty regulations. But being here has just made me stronger and given a depth of my understanding of concepts such as privilege and solidarity. They labelled us ‘criminals’ and try to shame us into compliance, or rely on other prisoners to do their work – policing, pandering and grasping of imagined rewards and “earned privileges”. But knowing I am not alone in my struggle gives me strength and vigilance. Gove has begin to change the rhetoric surrounding prisoners: we are now potential assets, we are to quote him, “a literally captive population”. He is promising early release for those who ‘show their chained attitude that they wish to contribute to society’. We are led through our time by those benign dictators, our ‘Offender Managers’, who calmly construct our sentence plans and ‘therapeutic’ programmes (also known as prisons-within-prisons). The Prison “Service” is like an abusive partner: offering calming reassurances whilst deliberately alienating, excluding, and physically and mentally controlling us. This can never be a therapeutic environment. Martin Luther King said we are all “caught in an inescapable network of mutuality. What affects one directly affects all indirectly”. These networks bear down on us in biased and relentless ways. Prison is often the final step for those who have been excluded and controlled by the wider mechanisms of the state their whole lives. The numbers of deaths (at the hands of the screws, filth and suicides) in custody and on the streets continue to rise, discussed and minimized. Self harm is rife within women’s prisons. The Ministry of Justice plan to sell off many parts of the prison estate, its so called ‘dark corners’ (many of which happen to be in prime locations). Gove claims that it is this cleansing desire and economic, which is driving the developments. But whether its the Queen or rich landlords who will benefit, or the Ministry, is irrelevant… It’s all capitalist expansion. Solidarity to all anarchist prisoners and everyone harmed by the prison system. 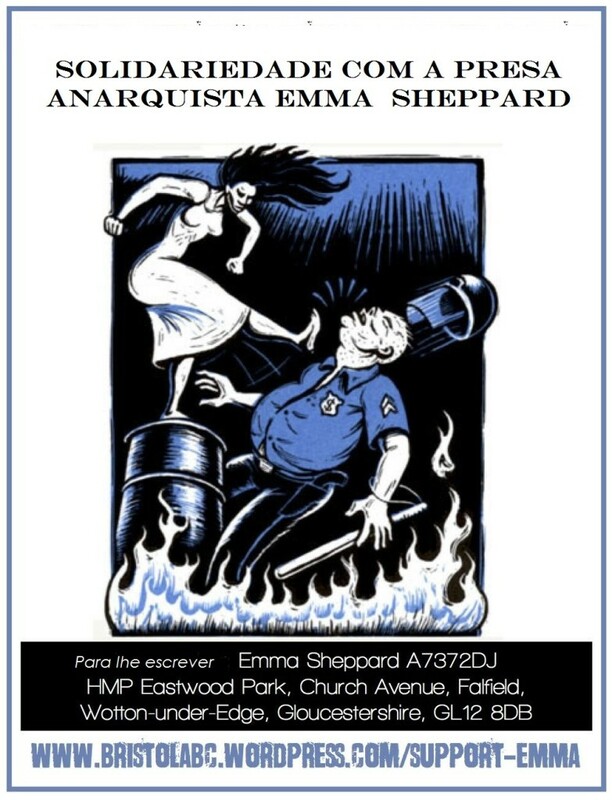 A new publication has been produced with writings from anarchist prisoner, Emma Sheppard. 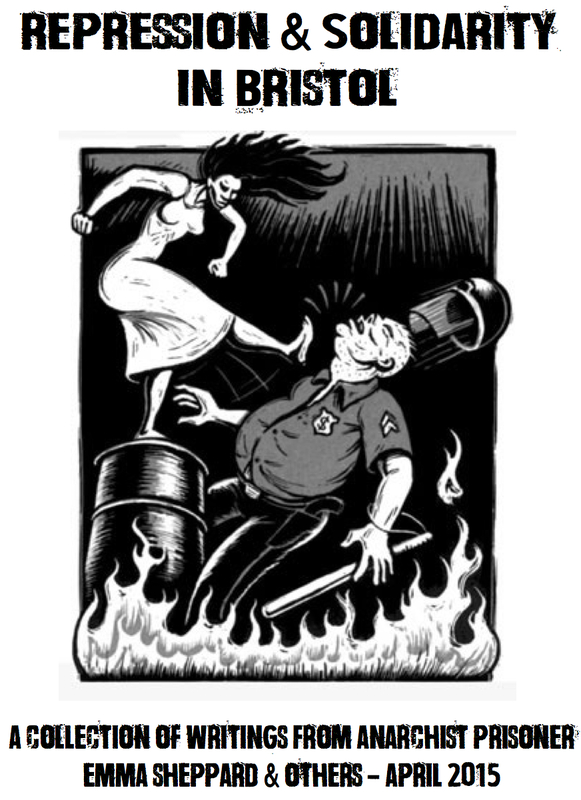 There are also articles from local groups such as Bristol Defendant Solidarity, communicating recent police attempts at repressing anarchist and other communities in Bristol. 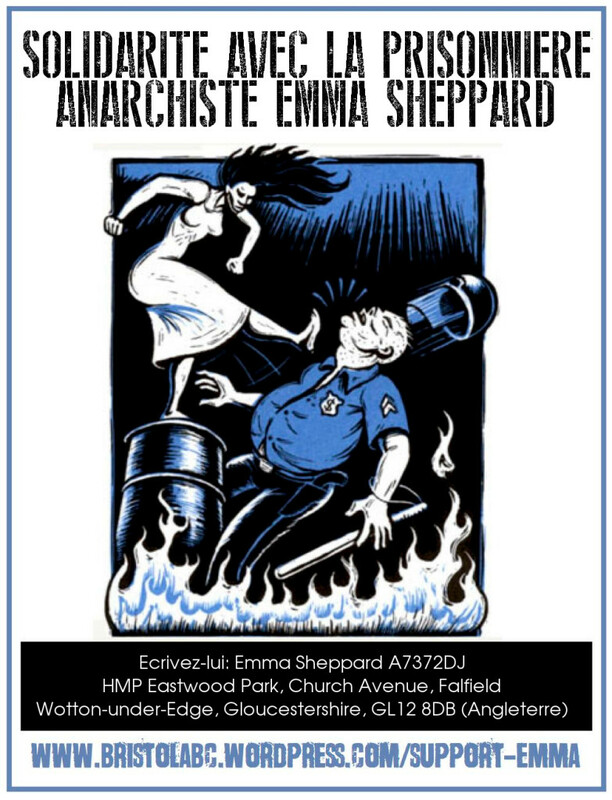 Anarchist prisoner, Emma Sheppard was sentenced to 2 years imprisonment on Tuesday 24th February 2015 at Bristol Crown Court for committing “Criminal damage recklessly endangering life”. The charge relates to criminal damage of police cars in the Bristol area. Emma can receive cards, stamps and stationary. Le 24 février 2015, la prisonnière anarchiste Emma Sheppard a été condamné à 2 ans de prison au tribunal de première instance de Bristol pour avoir « commis des dommages criminels inconsidérés mettant des vies en danger. » Les charges se rattachent à la dégradation de voitures de police dans la zone de Bristol. Emma peut recevoir des cartes, des timbres et de la papeterie. Il s’agit de la première condamnation s’inscrivant dans l’opération Rhone ; une investigation menée par 10 officiers CID [Central Intelligence Departement : Département de Renseignements Central] afin d’enquêter sur plus de 100 attaques anonymes dans la zone de Bristol au cours des quatre dernières années, de rassembler des informations sur le mouvement anarchiste au sens large, ainsi que de traquer le camarade fugitif Badger, qui a pris la fuite en août 2011. Cependant, l’arrestation d’Emma et le plaidoyé de culpabilité relatif à un sabotage la veille du Nouvel An se révèlent être des cas à part et ne résultent pas du travail engagé par l ‘opération Rhone – combien même ils ont été impliqué par la suite. Die anarchistische Gefangene Emma Sheppard wurde am Dienstag, dem 24 Februar 2015 vom Bristol Gericht in England zu zwei Jahren Gefängnis für „schwere Sachbeschädigung und fahrlässige in Gefahrbringung von Menschenleben“ verurteilt. Die Strafe bezieht sich auf die Beschädigung von Polizeiautos in Bristol. Emma kann Postkarten, Briefmarken und Schreibmaterial empfangen. In Reaktion auf ihr Urteil hat Emma Sheppard einen Brief verfasst (teilweise Übersetzung hier). Anmerkung von Contra Info (en): Dies ist die erste Verurteilung unter der „Operation Rhone“. Eine Ermittlung, geführt von 10 CID Offizieren, um in den über hundert anonymen Aktionen in der Gegend um Bristol in den letzten vier Jahren zu ermitteln und weitreichende Informationen über das weitere anarchistische Milieu zu sammeln und außerdem den geflüchteten Genossen Badger, der im August 2011 floh, zu finden. Emmas Verhaftung und ihr Schuldspruch wegen der Sabotage-Aktion am Silvesterabend scheint jedoch ein allein stehender Fall zu sein und war nicht das Resultat der Arbeit von „Operation Rhone“ auch wenn diese im Nachhinein hinzugezogen wurden. A 24 de Fevereiro de 2015 a presa anarquista Emma Sheppard foi condenada a dois anos de prisão pelo tribunal penal de Bristol por “cometer danos criminais de forma imprudente colocando em risco a vida.” A acusação refere-se a danos em carros de polícia, na área de Bristol. Emma pode receber cartões, selos e artigos de papelaria. Esta é a primeira condenação no âmbito da Operação Rhone; uma investigação conduzida por 10 oficiais da CID [Central Intelligence Departement: Departamento Central de recolha de informações ] para investigar mais de 100 ações de ataques anónimos na área de Bristol, ao longo dos últimos quatro anos, permitiu recolheu informações sobre o movimento anarquista mais amplo, bem como a caça ao companheiro fugitivo “Badger”, em fuga desde Agosto de 2011. No entanto, a prisão de Emma e a declaração de culpa relativa a uma sabotagem na véspera de Ano Novo parecem ser um caso isolado e não foram o resultado de um trabalho da Operação Rhone – embora as tenham envolvido nela, depois disso. El 24 de febrero del 2015 la anarquista Emma Sheppard fue sentenciada a 2 años de prisión por el Tribunal de la Corona de Bristol con la acusación de “cometer daños materiales poniendo en peligro vidas de manera imprudente”. Los cargos hacen referencia a los daños ocasionados a vehículos de policía en la zona de Bristol. Nota de Contra Info: Esta es la primera condena en el marco de la Operación “Rhone”, que es dirigida por 10 agentes del Departamiento de Investigación Criminal (CID). El dispositivo pretende investigar más de 100 ataques anónimos en la zona de Bristol durante los últimos 4 años, acumular Iinformaciones sobre el movimiento anarquista en un sentido más amplio, así como perseguir al compa Huw ‘Badger’ Norfolk, que está en fuga desde el agosto del 2011, acusado por el ataque a la sede del periódico Bristol Post. En cualquier caso, la detención de Emma y su asunción de culpabilidad en relación con el sabotaje que se realizó la vispera de Año Nuevo parecen ser un caso aparte y no un resultado directo del trabajo represivo de la Operación “Rhone”, aunque se enmarcó en este contexto más tarde.